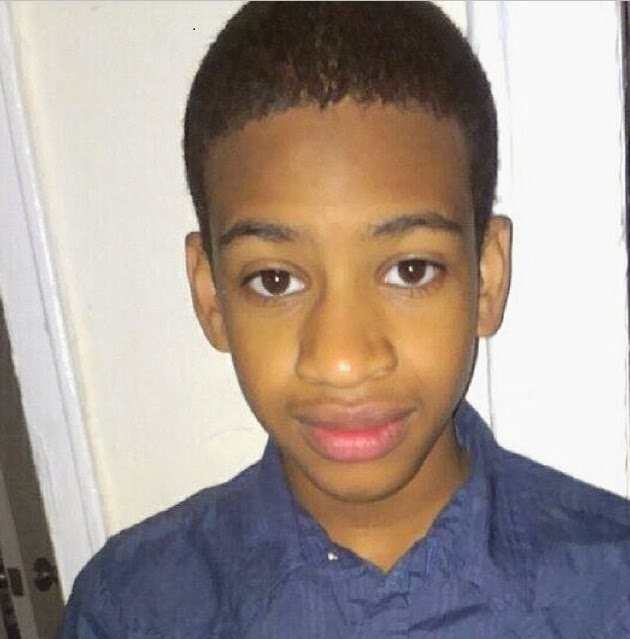 I learned about this beautiful child named Avonte Oquendo, shortly after he went missing. I had never met his mother or family, but this child touched my heart. When I saw his picture, his eyes spoke to my soul. I reached out to people about him; no one who knows me would ever be able to say…I didn’t know she felt that way. I was very vocal about him. When I learned of his death, it made my heart heavy. I had someone very close to me, who had autism. He had many difficulties living, in “the real world”. Much like Avonte, he had eyes that spoke to your soul. You couldn’t help but to love him. His life was also cut short. I cannot imagine the sheer hell that these mothers must have gone through. Not only because of losing a child, but how their lives had been molded around the protection and nurturing of these children. What are they to do now? We are at an advantage, we can turn off the news. But when I searched Avonte’s name, I found no known cause of death and no article written past January. While we can just move along…as the world keeps on spinning; Avonte’s mom must try and make sense out of this. My prayers are with her. If I could tell her anything I would say; I saw the light in his eyes too. I saw the wonder and love that you bathed him in, every day of his life. And even though he was unable to verbally communicate; your heart connected with his. I believe whole-heartedly that the love you instilled within him…remained with him throughout his stay with us here. And while I am certain that this may not ease your pain right now…I pray that your journey through this grief…is built on the grace and mercy of a most loving Creator. I am saddened when I think of how brief Avonte’s life was…but my heart cannot help but to shine…knowing that angels are singing more loudly and Heaven became a much brighter place…all for the love of Avonte. I am writing this today, because I can no longer bite my tongue. I thought I could remain silent after the trial…but I see that I cannot; not after watching your video. I understand it must be difficult when you feel like the whole world doesn’t know you and you are being judged. It must be difficult trying to find employment and real friends; but since you don’t seem to understand it…I wanted to sit down with you a moment and try and make sense out of it. …It was a rainy night; not too much rain…but just enough that the teenager had difficulty seeing things clearly. It was just a snack; something to hold him over throughout the night…not a big deal. As he left the store, he put his hood on, so he wouldn’t get wet. His mom was always getting on him for going out in the rain and waking up sick the next day. Since he was at his dad’s house, he didn’t want his mom to get mad at him too. He looked up and noticed a vehicle that seemed unfamiliar. It drove slowly by; maybe he thought I was someone he knew… the child said to himself. He called his best friend joking with her and noticed the SUV driving past again; he made a sidebar joke with his bestie…and kept walking. He begins to get nervous; the vehicle rides past again slowly…looking…lurking…yet no word is spoken. The child’s heart starts beating faster. His mouth salivating, as his nervousness increases. He must make sure that this person isn’t after him; so he runs down random streets to try and lose him. Again the mysterious vehicle follows him. He knows that he could run straight to his dad’s house and be safe, but then the stranger would know where he lived and worse where his family lived. George, I know you have your own version of what happened that night…and unfortunately, your version is the only one that we will know. I watched you in court. I looked for a person who was truly sorry for what happened. I sought a person who felt that the killing of a teenager was a horrible outcome of this story. I did not find that person in your eyes. You stated recently that people don’t know the real you; and that other than what they have seen in regards to this case, they don’t know you…at all. You even stated, in defense of the, “He’s a racist”, claim; that you had been mentoring a black child. I hope that you understand what an insult that is. I always find humor with people that say…”I’m not prejudiced…I have a black friend”. You would probably be better served to not do that again. I do have some loving advice for you; as I feel compelled to reach out to you. Don’t get me wrong…regardless of what the state of Florida says…I think that you are guilty. I think that you should have been punished…someone died. That someone had a name, an address…he had a family and because of your actions…he also had a funeral. I think that the largest injustice that was done, in your defense, was to make Trayvon Martin appear to be the assailant. The media and your legal team made an issue, out of the fact, that Trayvon had been suspended from school for having trace amounts of marijuana in his book back. They made issue out of the fact that he had tattoos. They made issue out of the fact that he had gold teeth and that he made a video showing gang signs. They even made issue out of the fact that Sabrina Fulton, Trayvon Martin’s mother, chose to use pictures of her son at an earlier age. I digress…let’s get back to you and what is really important. If you want the world to see you differently…stop signing autographs at gun shows. This does not say that you have any compassion or empathy for a nation that is mourning the loss of this child. Volunteer at a children’s shelter, read books to kids at a library, and show the world that you regret what you did. It’s okay, you can’t be prosecuted again. Clear your soul…tell the truth. Do not write a book about how you have it so hard, because of the trial. You have it hard because you killed someone and the world noticed. You have it hard, because even you, don’t think that you are innocent…and your soul is torturing you. Understand that your words…will not bring back that wonderful child. His family will miss him for the rest of their lives. And while you are making statements about living in poverty and having no friends…the Martin family…has one less place to set at dinner. They have to find a way to go on living without their son…while you still get to breathe. You are still alive…I would offer to you this: make the most out of your moments. Do not spend an ounce of your day feeling sorry for your situation. Starting today do something different; stop looking out for George…and look out for someone else. Volunteer…or better yet; I would suggest that you go to a meeting for parents whose children have been killed. Stay and listen to their stories…let it soak in. Pray. I only hope, that in that prayer that you will really understand the brevity of what you have done. You will know if it did…because you will no longer be singing the “What about me” song. I pray that our Creator will be merciful with you…in your growth. I cannot hate you…while my emotions may scream for it…I know that hate is something that my soul refuses to do. I do hate what happened. I pray every day that no other family will have to bury their child too soon. I pray that we realize that a tattoo, skin tone, and/or drug use…does not make any of this okay. George, I will leave you with one more thought: In your journey for understanding…look deeper into yourself; work on the man that you want to become…and seek forgiveness. The anger and frustration you feel…does not come from any place other than within. Often, I think we can take our loved ones for granted. We may even feel or think that we were “due” these relationships. While I cannot imagine what we could do to deserve or earn these crowned accomplishments…it does appear to be the case, even if only in the minds of a select few. We were gifted moments with our loved ones. We can often become so comfortable with what we appear to have with them, that we forget that these moments were never “given” and were never intended to be permanent. Intentionally or not, we develop a sense of entitlement and this becomes dangerous. People are not possessions and while we may love them in a very human way; human love comes with stipulations, quite often. Human love is relationship oriented. “I will love you, as long as you don’t…” It is companionship love and can also be a beautiful thing. Anytime we try to grasp something and hold onto it in that way; like most caged birds…it will long to fly away. When the moments we were gifted become grief…life can begin to look glum. We may become angry and become withdrawn. While this happens often, it is important to try and understand that: Those moments, which have now evolved into memories, are still gifts. You see the fact that the people attached to those moments were ever within our grasp…is a fallacy. Those people, our loved ones who have passed, never belonged to us. They willfully stayed in our lives, for whatever period of time or space. They chose to be a part of our millions and millions of moments, while we are visiting this place. While we may grow sad or angry that we cannot make more moments with their physical presence; do not allow that bitterness to cause you to turn away from life and the love that is still here for you. The moments that we have been gifted are intended to create a foundation for other relationships. I am often reminded of the very loving nature of our Creator; when I am provided the opportunity to look back at the memories that I have been gifted in my life. As humans, we can become very selfish and want those times, events, relationships to stay just as they are; but just as the world keeps moving…so must we. We must absorb the love, kindness and joy of these moments and memorialize them in our hearts. And on days when the world seems particularly harsh…we will find that smile from our memory. The smile that we may have taken for granted, years and years ago. And the memory of that archived smile…will lay the foundation for a new smile. In this way, the people that we grieve…never really leave us. Recently my father in law passed away, and right around the time which he either had just passed or was getting ready to do so…the radio in his van came on while my husband was driving. It didn’t just come on…but it blared so loudly that it shook our insides. Try as he may, my husband was unable to turn that radio down or off…until all of a sudden it turned off all by itself. Now we were told that the radio never worked in the van, but we both experienced it. In our hearts, we know that he was letting us know that we were going to be alright and that he had gone home. We could have made that experience negative, but even after we had learned that he had passed on…the thought of that moment made us smile. What does all of this mean? It doesn’t mean that we should not miss them or that we shouldn’t grieve. It means that we should appreciate and embrace every moment of every day. I would not wish upon any one the hurt that regret tends to bring. Go to sleep every night with the knowledge that you made the most out of each day; and awake with the thought that today will be better than yesterday. More importantly, do not dwell on all that yesterday wasn’t, or you will bring that same energy into this day. People that we love will, at one time or another, be called home. Do not allow that knowledge to keep you from opening your heart to that kind of love. When we shield our hearts from pain; we inadvertently shield love from our lives, as well. The most beautiful times in my family occurs when I am sharing the conversations that I had with my grandmother, as a child. It makes my heart feel warm and brilliant. I not only remember her stories and songs, but I can feel her all around me…and I wouldn’t trade that for anything. There are no guarantees in this life. We were only sent here to realize our purpose and to fulfill it. So while we are here…touch as many hearts as you can. Exhibit what is called Divine Love. In this, Divine Love is defined as…that without definition. It cannot be contained or denied. Divine love has no opposition…it simply is. Divine love is what our Creator, gives us. There is nothing to compare it to; it is inclusive of all things…which is where we get the idea of “Allness”. Love all day every day…it takes nothing away from you and your rewards are boundless. If you exhibit Divine Love in all things…regret cannot exist. And do not be troubled with the idea of hate…hate is bred out of fear. Even fear can be lessened out of existence…when it is surrounded by love and patience. We must allow ourselves to let go of the things we are not sure of…similar to letting go of the side of the pool, when we are unsure if we trust ourselves enough to swim toward the center. The water that surrounds us is Divine Love…and if you KNOW TRUE love…you will understand that it never varies. Divine Love never wavers, it is constant and consistent. You are never alone, for you are a part of ALL. When we allow ourselves to open our hearts to this kind of love…we understand that loss…is an illusion. Sometimes we take those we hold the closest for granted. I don’t think it is something that anyone intends to do; certainly nothing that I would ever intentionally do. But all too often, we take precious moments with those we love the most and feel that we may have time to express this or that; and often that is a false sense of security. Time is a fallacy. The true measure of time is not held in minutes…but in moments. And often, we spend so many moments complaining about time…that the sands in our hour glass slip away. Tomorrow is not promised, as we have been shown…in the most painful ways. I want to not allow another moment to go by with that thought in my mind. I can remember the morning that I received the phone call about my sister; the first phone call saying that she wasn’t breathing. I jumped out of bed…knowing I had to go to her. I remember breathing heavily as I told you that I had to go to New York. It seemed like hours later, but in reality it was only about five minutes, before I would receive the second phone call stating that she was gone. You spoke cautiously, barely above a whisper…”are you okay?” I said the only thing that I knew to say…”I don’t know what ‘okay’ is anymore”. It still brings a lump to my throat when I think of those moments. The only thing that I could compare that moment to …was another monumental day. When the first plane hit the Twin Towers…I remember just absorbing what the news had told us; and then the second plane it. The breath was knocked out of a nation…and that was the same emotion that the second phone call had on me. I was blindsided. No one is ever really prepared for that moment. When she died, I was left with a large gaping hole in my heart. How does a person find the strength to go on, when the one constant love in their life has been taken away? I felt like a large balloon that someone had poked a small hole in. Every day I felt my life slipping away. I cried more often than I even allowed you to know. I was drowning in memories and the thought that she and I would create no more. You saved me. You listened and held me close to your heart. You made how I grieved okay. You made my heart ache less…because you never told me NOT to talk about her. Slowly, I began to live again. You made everything that I felt and thought…okay. You breathed love back into my badly battered heart. There is no way to repay that gift. And if you or I were to ever keep score of who did what for whom…you won the game that day. These moments cannot be expressed and acknowledged enough. While it would probably be enough that you encouraged me to write about her; your love took you many steps further. You helped me find my smile and it hasn’t left me since. I live with an illness that attempts to kill my body every day. I live with the fact that Lupus uses other health conditions to try and slow me down. I suffer with Sjogrens and I have had multiple strokes…due to how seriously Lupus tends to lead an attack on my body. And every single day you remind me that I am blessed. You encourage my spirit…and because you show up every day…I refuse to quit fighting. While I may receive kudos and pats on the back for being strong enough to endure Lupus, Cancer and Strokes…you are my unsung hero. You simply allow my heart to melt into yours…and the stars seem to shine more brightly again. I think the thing that people always tend to forget is that without darkness…we would never know the light. We cannot measure good…unless we have experienced evil. We have to have a measure…by which to compare these precious moments. There are some obstacles that we are simply destined to overcome. If I hadn’t known darkness…I would have never have known the light…of your love. I am truly blessed. There simply are no words that have ever been written or murmured that could ever express all that you are to me; but I will gladly search the rest of my life looking for them. You give me something to look up to. You make me want to be a better person. Some may look at you and see a beautiful man; and while I cannot disagree…I see more. For when I look at you…I see God. A Creator who loved me so much; that my heart was given a “forever home”. So while these thoughts may not find the words to tell you often enough…I thank you. Thank you for being you…and for loving me without restrictions. I love you…for more reasons than can be counted in a lifetime. I think that sometimes we can get lost in the commercialization of things this time of year. The proof of that is everywhere we look. Every store or shop seems to have their own idea of how to make the season more festive and memorable than the year previous. This year, however, has been a little rougher for me than most have been…which I believe is a test of my strength and willingness to submit to the will of our Creator. So I have sat and endured every Christmas cartoon known to man…I have watched store Santa’s posing with pictures of children who would rather be ducking and weaving in and out of a four lane highway. I have watched retailers attempt to make their sales and “bargains” look like what we might want Christmas to be. All of this, isn’t always a bad thing…it’s always nice to see the excitement of children and the hidden secrets that this particular holiday seems to bring. This year was completely turned around for me…I was all ready to become “Scrooge”. And in my mind, I had reason to. Then something wonderful happened in my life…I experienced the love of God through the heart of my daughter. First you must understand, she is a teenager…not unlike most teenagers. She wants things, and she knows that there will be things that no matter how much she wants them, or how much I wish I could get them for her…she just won’t receive them. But this brown eyed beauty decided that this year for Christmas she wanted to play Santa Claus for a child on her school’s “Angel Tree”. Keeping in mind that she knew that by us buying for another child meant that her lean Christmas list…just went on a diet. She didn’t care. I remember the day that she was talking to me about it…tears in her eyes. She just wanted to make a child happy for Christmas. And so we went shopping for this sweet 2 year old boy that she didn’t know and would never meet. We got him a few things…which she picked out. She went home and wrapped them and placed them in a giant gift bag and took them to school. I can not even begin to express to you the joy that I felt through her at that moment. But I can only really think of one comparison which may assist in my lack of descriptive prose. Watching her was like the feeling I would get as a young child coming in from the cold. I would get to drink this giant coffee cup filled with creamy Hot Cocoa…you know the kind I mean…with the foam on the top from the giant melted marshmallow that used to be there. When you drank it, it was like your body was literally thawing out. There were parts of my body that were coming to life that I didn’t even realize were frozen. My daughter became that for me…a sweet, warm, smiling example of that chocolaty goodness. And the real magic was…she made everyone feel that way. We all laughed and sang songs and smiled at everyone today. All of this made me think about the saying…the reason for the season; it was like a light bulb came on. The reason for the season…is to give to others that in which we are given. It isn’t about video games or wish lists. It is about reflecting the love that God has given us…and sharing it with everyone else. It may be true that we don’t have as much as the next person, but what we have is intended to be shared. I always try to remind others of our blessings, because we can get caught up in what we don’t have and we forget what we do have. We may not have tons of presents under the tree, and as true as that is…there will be people who do not have a home to put a tree in…never mind the presents underneath. We may not have a huge Christmas feast, but there are people who will not have food to eat on Christmas at all…or any other day. We will miss those we lost this year and our hearts may weep for them…but there are people who will spend this holiday all alone. Can you imagine living on this huge planet and feeling like you are all alone? Today my daughter warmed our hearts…by simply opening hers. I hope it is an example that is set not in vain. Reach out for someone today, touch their hearts and don’t be afraid to warm their souls. God only asks that we give to others what HE has given to us…HIS LOVE. It costs nothing to love one another. If the only present you give to someone is your time…it is time well spent. Shine on one another…the reflection is that of our Creator. So I was thinking today…what does death mean to me? This is important this time of year, because of the holidays that we have spent together. Anyone who has ever lost anyone due to death knows what I am talking about; we do not want to take special occasions that we spent, with those loved ones, and make them hurtful or negative to think about. There had to be another way to think about this, I thought to myself. Holidays are physical dates; we can’t cry or scare them away with our inability to evolve our feelings into experiences. I noticed though, especially in myself, that was exactly what I wanted to do. What I noticed was, my sisters birthdate was still going to happen…whether my heart was ready for it or not. The holidays that we used to create beautiful memories…were still going to be holidays that come back around every year…even if I was angry that I was standing here…alone. How do I make this better for myself, so I can make it more bearable for others that love me too? Death became something different to me on January 4th. On that date death became my enemy; it was out to hurt me…and hurt I did. I remembered thinking to myself, as I did as a child when traumatic things happened, what could I have possibly done to deserve this? This, of course was a very immature thought and my higher-self did not allow me to hold onto the direction this was going toward. When I was reminded that this wasn’t about me; it brought back an image from TV or movies…where the actress was grabbed by the shoulders or smacked in the face…”SNAP OUT OF IT”!! Okay, so I got that it wasn’t about me…but I felt the emptiness and blankness that this loss gave me. I guess time was all I needed to make sense out of this. I loved my sister; and her death I felt was almost a welcome relief for her. She would no longer know pain or disappointment…and I could want no less for her and still claim to love her. What does death mean to me? Death is our life “wake up” call. It reminds us how short our time on earth really is. How are we going to spend our last days and moments here? The last thing I would want to leave as my legacy is that I was angry at death…before it ever knocked on my door. Death leaves a trail of grief; it has no time line. It can come rushing back into our thoughts without any notice. We all have to survive it the best way that we can. I took the bittersweet memories of my sister and created a recipe of life basted in love. I think we all know someone who lost someone…let us be there for them. Nothing begins the healing process like a cup of kindness and a dash of laughter. Laugh often…share memories; the place these angels had in our lives was filled beautifully…don’t let that be in vain. Spread their memories…shine their love through your laughter. Upon writing this I learned of the death of actor Paul Walker. I hope you will join me in praying for his daughter and family…during this most difficult time. As always…may Love and Light be with you forever.